Do you take part in a Christmas Ornament Exchange? Do you like to make DIY Christmas ornaments to give out each year at your Christmas party? Or perhaps you like to make homemade ornaments for you own tree each year? 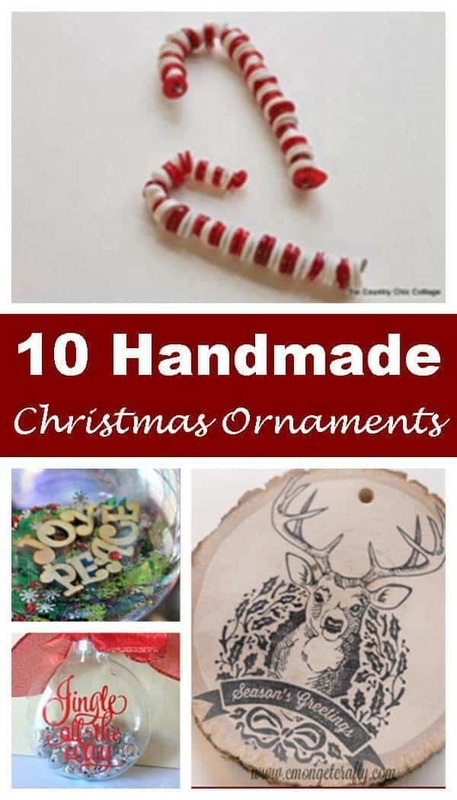 Regardless of the reason, the 10 handmade Christmas ornaments below will give you some great ideas for your own DIY ornaments this year! These easy-to-make LEGO wreath ornaments are perfect for housing a photo the the little builder in your family! Adding some jingle bells and a the words “Jingle all the way” to a clear ornament makes for a simple DIY Christmas ornament. I am sure you can get the little ones to help fill them too! If you love mason jars, these lovely mason jar lid ornaments are perfect for you. Paired with some flannel fabric, they have a nice rustic look. 5. Secret Message Ornament – C'mon, Get Crafty These secret message ornaments remind me of snow-globes. You simple add your “secret message,” along with some sequins and glitter, into a clear globe ornament. Then, give the ornament a shake to reveal the secret message! These wooden photo plaque ornaments are perfect for showcasing family photos from throughout the year. I have a thing for woodland animals so these terrific felt deer and fox ornaments make me soooooo happy. They are simple to make using the pattern provided, and they are just oh-so-cute! Threading red and white buttons together using floral wire creates these adorable candy cane ornaments. Using wood slices, a festive stamp, and a piece of twine, these rustic DIY Christmas ornaments come together in no time at all. Let us know in the comments below what handmade Christmas ornaments you will be making this year! This is a great link up!! I’m feeling a bit of the craft bug finally coming back after a long dry spell. I really like the secret messages ornaments from Cmon get crafty. I love the ice skates ornament – so cute! I love making small crafts like these. Thanks for sharing these. What a great idea of making home made ornaments. i Love the Cinnamon Cookie Ornament.